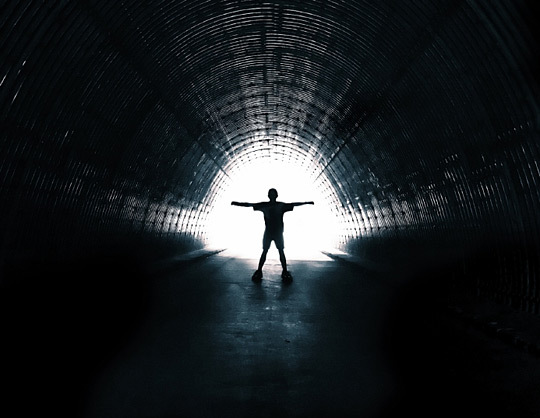 Decoding The Mystery Of Near-Death Experiences Some researchers are exploring whether a mind can operate while the brain has stopped. One neuroscientist says that after a near-death experience, people's brains appear to undergo changes at the neural level. Scientists use new technologies to analyze brains of people who claim to have touched the spiritual. 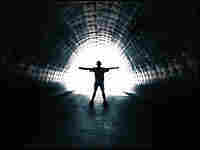 Scientists have long dismissed reports of people "seeing the light" during near-death experiences. But now researchers are taking a closer look and asking whether a mind can operate while the brain has stopped. I met Pam Reynolds in her tour bus. 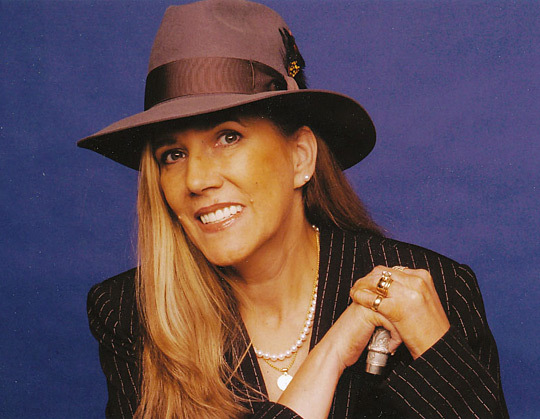 She's a big deal in the music world — her company, Southern Tracks, has recorded music by everyone from Bruce Springsteen to Pearl Jam to REM. But you've probably never heard her favorite song. It's the one Reynolds wrote about the time she traveled to death's door and back. The experience has made her something of a rock star in the near-death world. Believers say she is proof positive that the mind can operate when the brain is stilled. Nonbelievers say she's nothing of the sort. Singer-songwriter Pam Reynolds says she had a near-death experience during brain surgery in 1991. The doctors drained the blood from her head to snip an aneurysm. She says she found herself looking down at the operating table — and then noticed a tunnel and a bright light. Reynolds' journey began one hot August day in 1991. "I was in Virginia Beach, Va., with my husband," she recalls. "We were promoting a new record. And I inexplicably forgot how to talk. I've got a big mouth. I never forget how to talk." An MRI revealed an aneurysm on her brain stem. It was already leaking, a ticking time bomb. Her doctor in Atlanta said her best hope was a young brain surgeon at the Barrow Neurological Institute in Arizona named Robert Spetzler. "The aneurysm was very large, which meant the risk of rupture was also very large," Spetzler says. "And it was in a location where the only way to really give her the very best odds of fixing it required what we call 'cardiac standstill.' "
It was a daring operation: Chilling her body, draining the blood out of her head like oil from a car engine, snipping the aneurysm and then bringing her back from the edge of death. "She is as deeply comatose as you can be and still be alive," Spetzler observes. When the operation began, the surgeons taped shut Reynolds' eyes and put molded speakers in her ears. The ear speakers, which made clicking sounds as loud as a jet plane taking off, allowed the surgeons to measure her brain stem activity and let them know when they could drain her blood. "I was lying there on the gurney minding my own business, seriously unconscious, when I started to hear a noise," Reynolds recalls. "It was a natural D, and as the sound continued — I don't know how to explain this, other than to go ahead and say it — I popped up out the top of my head." She says she found herself looking down at the operating table. She says she could see 20 people around the table and hear what sounded like a dentist's drill. She looked at the instrument in the surgeon's hand. "It was an odd-looking thing," she says. "It looked like the handle on my electric toothbrush." Reynolds observed the Midas Rex bone saw the surgeons used to cut open her head, the drill bits, and the case, which looked like the one where her father kept his socket wrenches. Then she noticed a surgeon at her left groin. "I heard a female voice say, 'Her arteries are too small.' And Dr. Spetzler — I think it was him — said, 'Use the other side,' " Reynolds says. Soon after, the surgeons began to lower her body temperature to 60 degrees. It was about that time that Reynolds believes she noticed a tunnel and bright light. She eventually flat-lined completely, and the surgeons drained the blood out of her head. During her near-death experience, she says she chatted with her dead grandmother and uncle, who escorted her back to the operating room. She says as they looked down on her body, she could hear the Eagles' song "Hotel California" playing in the operating room as the doctors restarted her heart. She says her body looked like a train wreck, and she said she didn't want to return. "My uncle pushed me," she says, laughing. "And when I hit the body, the line in the song was, 'You can check out anytime you like, but you can never leave.' And I opened my eyes and I said, 'You know, that is really insensitive!' "
Michael Sabom, a cardiologist in Atlanta who researches near-death experiences, believes that Pam Reynolds' "physical sensory perception was off the table" during her surgery. Other physicians disagree. Afterwards, Reynolds assumed she had been hallucinating. But a year later, she mentioned the details to her neurosurgeon. Spetzler says her account matched his memory. "From a scientific perspective," he says, "I have absolutely no explanation about how it could have happened." Spetzler did not check out all the details, but Michael Sabom did. 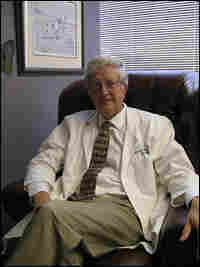 Sabom is a cardiologist in Atlanta who was researching near-death experiences. "With Pam's permission, they sent me her records from the surgery," he says. "And long story short, what she said happened to her is actually what Spetzler did with her out in Arizona." According to the records, there were 20 doctors in the room. There was a conversation about the veins in her left leg. She was defibrillated. They were playing "Hotel California." How about that bone saw? Sabom got a photo from the manufacturer — and it does look like an electric toothbrush. How, Sabom wonders, could she know these things? "She could not have heard [it], because of what they did to her ears," he says. "In addition, both of her eyes were taped shut, so she couldn't open her eyes and see what was going on. So her physical sensory perception was off the table." That's preposterous, says anesthesiologist Gerald Woerlee. "This report provides absolutely no evidence for survival of any sort of consciousness outside the body during near-death experiences or any other such experiences," he says. Woerlee, an Australian researcher and near-death experience debunker who has investigated Reynolds' case, says what happened to her is easy to explain. He says when they cut into her head, she was jolted into consciousness. At that point, they had not yet drained blood from her brain. He believes she could hear — despite the clicking earplugs. "There are various explanations," Woerlee says. "One: that the earphones or plugs were not that tightly fitting. Two: It could have been that it was due to sound transmission through the operating table itself." So Reynolds could have heard conversations. As for seeing the Midas Rex bone saw, he says, she recognized a sound from her childhood. "She made a picture in her mind of a machine or a device which was very similar to what she was familiar with — a dental drill," Woerlee says. Woerlee says Reynolds experienced anesthesia awareness, in which a person is conscious but can't move. He figures back in 1991, that happened in 1 out of every 2,000 operations. That doesn't convince cardiologist Sabom or neurosurgeon Spetzler. They believe the combination of anesthesia and the sluggish brain activity caused by hypothermia meant that Reynolds could not form or retain memories for a significant part of the operation. At the very least, Sabom says, Reynolds' story raises the possibility that consciousness can function even when the brain is offline. "Is there some type of awareness that occurs from a nonfunctional, physical brain?" Sabom asks. "And if there is, does that mean that there's a soul or spirit?" In the end, Reynolds' story is just an anecdote. And in fact, that's the problem with all the studies of near-death experiences. After all, you can't do clinical trials where you kill Mrs. Smith and tag along as she passes through the tunnel to the light, just to verify her story. Except in Hollywood, of course. In the 1990 movie Flatliners (starring Julia Roberts and Kiefer Sutherland), five medical students try to peer into the next world by stopping their hearts and returning to tell the tale. The movie inspired Mario Beauregard, a neuroscientist at the University of Montreal. What if he could do the next best thing? Since stopping people's hearts is a research no-no, he is asking people who have had near-death experiences to relive them while he looks to see what's happening in their head. "And it seems that these people have a different sort of brain," Beauregard says in his soft French accent. "It's like there's a shift in their brain, and this shift will allow these people to stay in touch with the spiritual world more easily, on a daily basis." Beauregard recruited 15 people who had a near-death experience. One of those was Gilles Bedard. In 1973, Bedard's heart stopped, and in the moments before he was resuscitated, he was greeted by what he describes as 12 beings of light. "And I felt it was like the breath of the universe. Because it was like ..." he says as he blows out his breath, slowly, like a low wind, "very, very peaceful." Since then, Bedard has meditated every day, and he says he often reconnects with the light. The research question is, how will his brain respond when he does? A Permanent Change In Brain Activity? For the experiment, Bedard is shut into an isolation chamber at Beauregard's Montreal lab. Bedard's head sprouts 32 electrodes, which will record his brain wave activity. He's told to relax for a few moments. Then he'll be instructed to imagine his near-death experience. A few minutes later, Beauregard and his research assistant are peering at a computer screen recording Bedard's brain waves. They cluck happily at the slow, large-amplitude Delta waves undulating across the screen — typical of a person in deep meditation or deep sleep. Afterward, the researcher asks Bedard if he was able to connect with the light. "Yeah, it was coming from within," he says. "It was loving, intelligent ... very powerful." It would take Beauregard a year to complete his research on near-death experiences. A few weeks ago, I called to ask him what he had found. "It's like the near-death experience triggered something at a neural level in the brain," he said. "And perhaps this change, in terms of brain activity, is sort of permanent." Beauregard says it's as if touching death jump-started the spiritual lives of these people. Their brains in the spiritual state look a lot like those of Catholic nuns and Buddhist monks who have spent tens of thousands of hours in prayer and meditation. Both groups showed extremely slow brain wave activity. The researchers also saw significant changes in brain regions associated with positive emotions, attention and personal boundaries, as subjects who had had near-death experiences lost their sense of their physical bodies and merged with God or the "light." Brain Chemistry Or A Trip To Heaven? Skeptic Woerlee says there's nothing remarkable — and certainly nothing spiritual — about these findings. "The brain function of many of these people who have undergone a near-death experience is altered," Woerlee says. "That's correct. It is altered. Extreme oxygen starvation does change brain function — because it causes brain damage to the larger cells in the brain." It's brain chemistry, he says, not a trip to heaven. In other words, Woerlee and Beauregard looked at the same images and came to opposite conclusions. I found that dichotomy everywhere as I interviewed experts about the emerging science of spirituality. It's kind of like a Rorschach test: Some researchers look at the data and say spiritual experience is only an electrical storm in the temporal lobe, or a brain gasping for oxygen — all fully explainable by science. Others say our brains are reflecting an encounter with the divine. And almost invariably, where a scientist stands on that issue has little to do with the clinical findings of any study. It has almost everything to do with the scientist's personal beliefs.